Patchwork Professional and another finish. Okay, first things first. 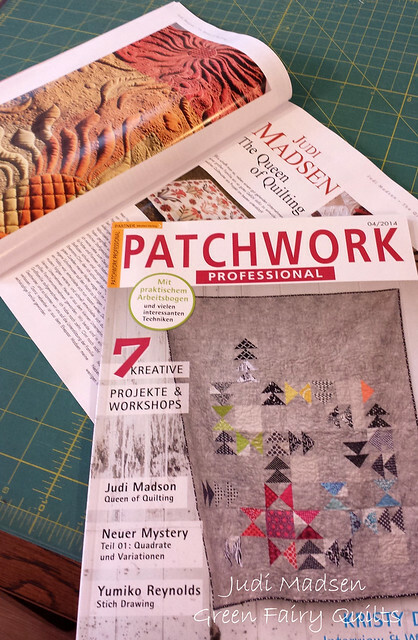 I had a happy mail day this week when I received my copy of Patchwork Professional. I was asked a few months ago if I would like to be featured in their magazine. Of course I would! It's a beautiful magazine and they did a fabulous job with the article. Now, I just need to brush up on my German to read it. ;-) The title of the article is Judi Madsen - The Queen of Quilting. Wow, that's quite the title and honor. I certainly wouldn't call myself that, but I thank them just the same. I still have to pinch myself every time I think about where quilting has taken me. An article in a German quilting magazine? That is totally cool and it makes the quilting world that much smaller. I love that quilting brings a common interest to so many of us throughout the world. I have to apologize that I didn't get better pictures of this quilt. It was raining and foggy when I finished this quilt and it's the same today. I grabbed a couple quick shots with my phone and then headed off to the post office to ship it off. Anyway, the thread was Glide - love that stuff. I used Magna-glide for the bobbin and I love the combination. The tension was perfect throughout the quilt. I used two layers of batting - 100% cotton and Hobbs 80/20 blend. This gives the quilt a wonderful texture. 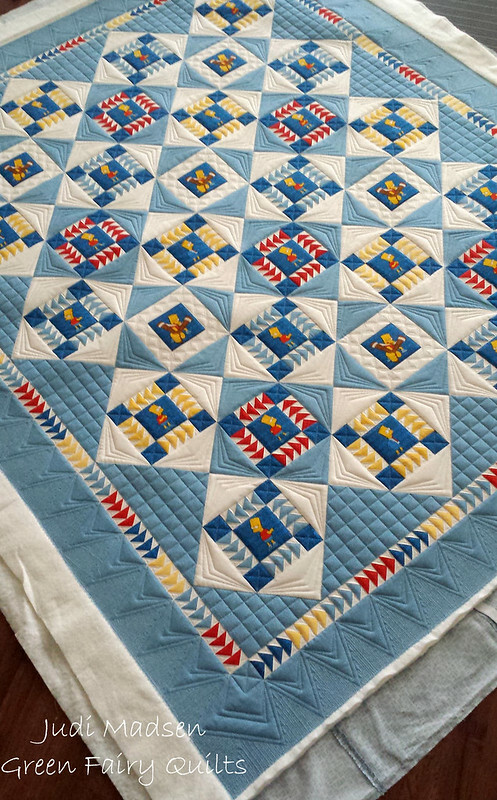 The quilting was a lot of straight lines and I did what I could to keep it simple. I had to refrain from quilting too much so that this quilt would be able to be cuddled with. Pretty sure this is my favorite border design that I have come up with. 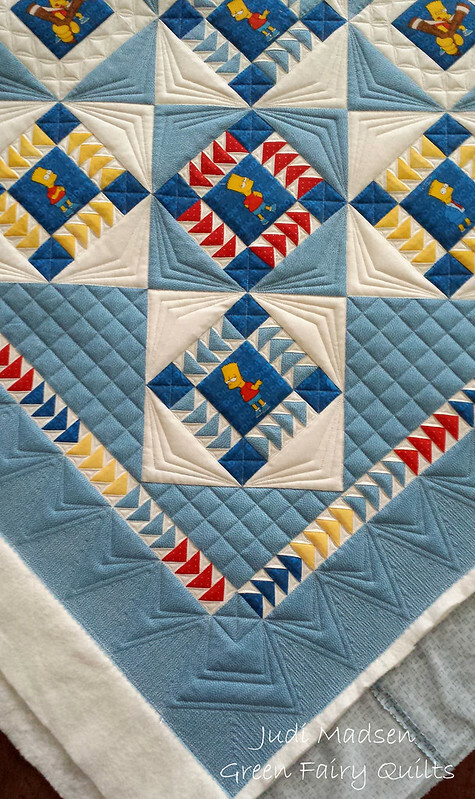 I really love how it frames out the quilt and compliments the flying geese throughout the quilt design.